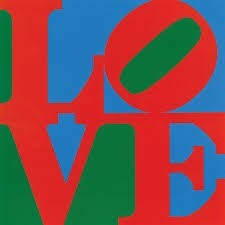 Prominent American artist Robert Indiana, best known for his iconic 1960’s LOVE series, died on May 19, 2018 in his home on Vinalhaven Island in Maine – he was 89 years old. Indiana’s adaptation of LOVE, the L & O stacked on top of V & E with the O tilting slightly to the right, resonated with the ideals of the 1960’s. Antiwar protesting, free love and experimentation, shedding remnants of the Cold War and addressing civil rights were all hotbed issues of this era. 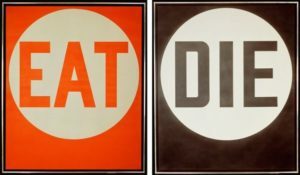 Indiana’s approach, using powerful words, numbers and solid areas of color with crisp, contained edges, made his work accessible to the masses. On the surface his work was easy to view and accept – less obvious was his intensely personal relationship to the words and numbers he chose. Indiana was born Robert Clark to adoptive parents Earl and Carmen Clark in 1928. He showed artistic talent as a child and was encouraged by his first grade teacher to stay true and develop his skills into a profession. Growing up, his home life endured waves of stress and insecurity as his father, once an executive with an oil company, lost his job and held a series of lower paying positions to make ends meet. By the time Robert was 17 he had lived in 21 different locations and suffered through the drama of his parent’s divorce. In retrospect, he claims this experience helped influence his attraction with numbers and powerful words, which became his signature. Graduating high school in 1946, Indiana enlisted in the U.S. Air Force, intending to fund his college studies through the G.I. Bill. In 1949, with his service complete, he enrolled at the Art Institute of Chicago and also studied at the Skowhegan School of Painting and Sculpture in Maine and the Edinburgh College of Art in Scotland before earning his BFA in 1954 and heading to New York. In 1956 Indiana met Ellsworth Kelly, and upon his recommendation joined a community of artists in Coenties Slip that would come to include Kelly, Agnes Martin, James Rosenquist, and Jack Youngerman. 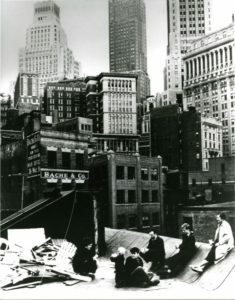 The environment of ‘The Slip’, where he and his fellow artists scavenged the area’s abandoned warehouses for materials and transformed them into large sculptures, had a profound impact on Indiana. The discovery of 19th century brass stencils led to the incorporation of brightly colored numbers and short emotionally charged words onto these sculptures as well as canvases, and became the basis of his new painterly vocabulary. Around this time Indiana decided to adopt his “nom de brush” of Indiana, acknowledging his mid western roots and solidifying his identity. 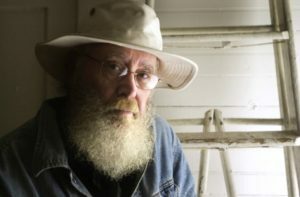 Indiana quickly became one of the most significant artists of his generation. 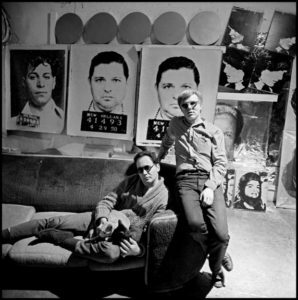 He is acknowledged as a leader of the Pop movement, along with Andy Warhol and Roy Lichtenstein, however this was not a label he embraced. “I do not like the word,” he stated emphatically. 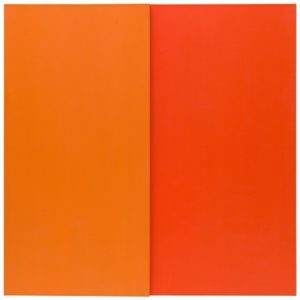 “I was Hard-Edge, I was not Pop.” Hard Edge is defined as a contemporary American geometric style of abstract painting, featuring an “economy of form,” “fullness of color,” and “neatness of surface.” Ellsworth Kelly is a dominant artist in this style and had a strong impact on Indiana. Despite his reservations about Pop, it colored the rest of his career and few Pop images are more widely recognized than Indiana’s LOVE. 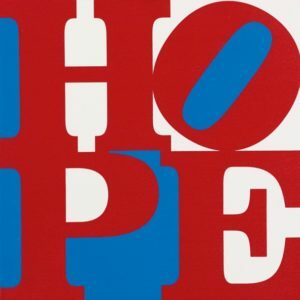 It was commissioned by The Museum of Modern Art in 1965 for a Christmas card and has appeared in prints, paintings, sculptures, banners, rings, tapestries, and on a best-selling United States Postal Service stamp in 1973. 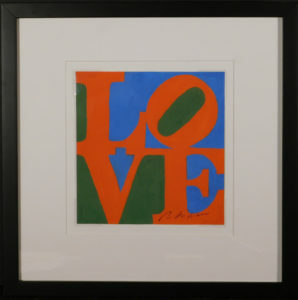 We are excited to offer a small study of LOVE in our upcoming Auction on June 7. 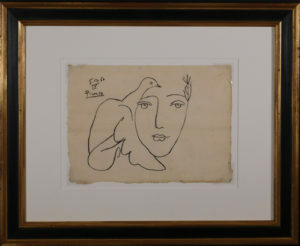 We also happen to have one of Picasso’s Peace Dove ink drawings available. Please register on our platform Woodshed Art Auctions for this upcoming event.